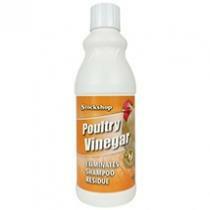 Stockshop Poultry Vinegar helps to remove any residue after shampooing. Add to warm water and work below fluff and feathers. Vinegar derived from acetous fermentation of ethyl alcohol containing 4-30% acetic acid (or 40-300 grain vinegar).